The Ursuline sisters have for a number of years been involved in Health Services as part of their apostolate. Sr. Rose started offering health services at Kitui District Hospital in 1996. She was later transferred to Kakuma Mission Hospital in the Diocese of Lodwar to continue with the same services. In 1998, Sr. Redempta started offering Health Services at Lodwar District Hospital. Later in May, she was requested to start a Dispensary at Knamkemer Parish, Lodwar. In January 2002, the Dispensary was handed over to Sr. Jacinta Kerubo, who was later joined by Sr. Veronica Kavutha. In 2004, Sr. Francisca Mulatya started the Dispensary at Kitale. It was then handed over to Sr. Jacinta in January, 2012. In 2007, Sr. Celestine was posted to Lorugum community and started offering Health Services at Lorugum Health Centre in Lodwar diocese. 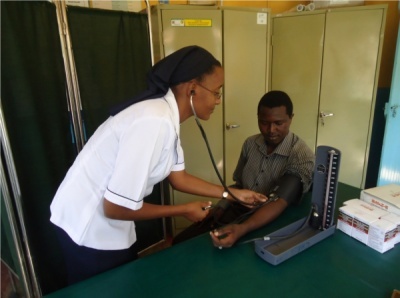 Currently, the Ursuline sisters are offering Health Services in the following dioceses: Kitui, Lodwar, Kitale and Nairobi. We can only thank God for the energy that He has granted us to offer our services to his people.